studio@grvoices.com...................770-649-7098 call me 770-649-7098 Call me! Welcome to GRVoices.com. 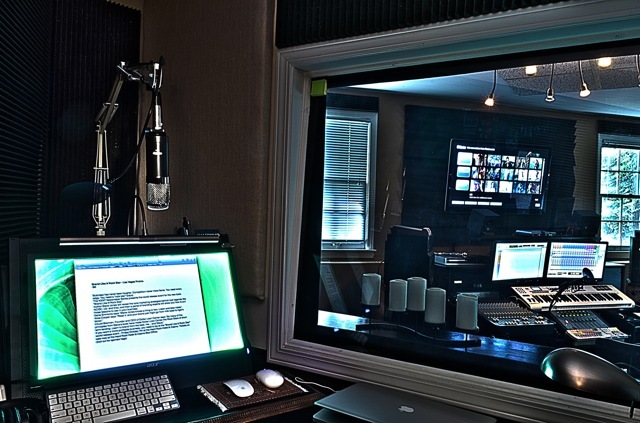 An award winning Atlanta based firm Specializing in voice and sound design for film, commercials, internet audio, Games, voice actor demos, imaging for radio. If it has to do with sound, Contact me, chances are I do it! I also enjoy using Ableton Live 9, Logic Pro And Maschine Studio. Depending on your creative goals, each lends its own special sauce. When it comes to sound design and music for your film, commercial or game project, there's a complete Sound FX library, as well as every sample library from Heavyocity, Output music, Project Sam, Native instruments and scores of others! Also available is ISDN, Source Connect Pro and multiple other means to send audio to a studio anywhere in The world if you wish to direct and record from your facility. If you like the industry standard of the Neumann U87 or the TLM-103, I can bring either online for our next session. Maybe you’d like to use my personal favorite - the MKH-416, made famous by Hollywood Movie Trailer Voice Actors. I Love the sound of my chain of the MKH into the Avalon VT 737, then into the Universal Audio Apollo Quad where I have some extra sweet love that gives It great character and warmth. Another great Mic is the original Sound Deluxe U195. Or if the sound you are looking for requires a Dynamic Mic's there is the popular broadcast RE-20 or, we can use the chain Bruce Sweden used to record Michael Jackson’s vocals on The Thriller LP- a Sure SM7B into n Neve 1084 into a 1176 Urei. And, Yes. I Am A Geek. I Love This Stuff. Geek along with me or leave it to me. If you like, we can customize your perfect sound for special sessions- or you can just leave it to me to tailor the right sound for your project. API, Neve, SSL, UA, Avalon, Focusrite, Tube Tech or more. Quality is what you get. You have got to love the sound of that! Some Mixers swear by analog. I agree. You do get an incredible depth of sound that you hear when you listen for it. This Is precisely why I like to use Analog and Plugins, especially on The Voice. But I also love the power and precision of mixing in the box! and I have a list of amazing plugins I have come to rely on for truly amazing audio and special effects. The list is too big to list. So just call 770-649-7098 or email studio@grvoices.com and ask.